Homecare4U services embed the 'Putting People First 'vision into its policies and practices in order to ensure individuals are able to live independently and have a complete choice and control of their lives. Homecare4U aims to provide a high standard of home care that will enable our clients to live safely and comfortably in their own homes, whilst maintaining their dignity and privacy. Homecare4U promotes the personalization agenda through its policies and practices. It is our aim to help our clients achieve the best possible quality of life whilst maintaining their independence. We aim to provide a high standard of home care that will enable you to live safely and comfortably in your own home, whilst maintaining your dignity and privacy. Looking for a caring job? We provide a range of live-in and visiting care services to clients across Cheshire, Stoke on Trent, Staffordshire and West Midlands. Our clients are primarily the elderly, the disabled and those convalescing from illness or accident. During the support planning process we will ensure your communication and information needs are considered and recorded. Our Homecare workers will at all times endeavor to meet your personal and communication needs. Regular review meetings will be held to ensure the services provided are appropriate and any changes are recorded in your support plan. Homecare4U aims to provide a high standard of home care that will enable our clients to live safely and comfortably in their own homes, whilst maintaining their dignity and privacy. We promote the personalization agenda through its policies and practices. 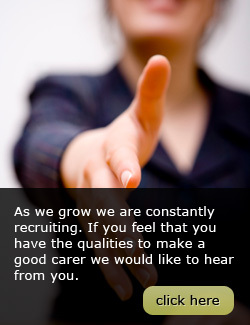 It is our aim to help our clients achieve the best possible quality of life whilst maintaining their independence.